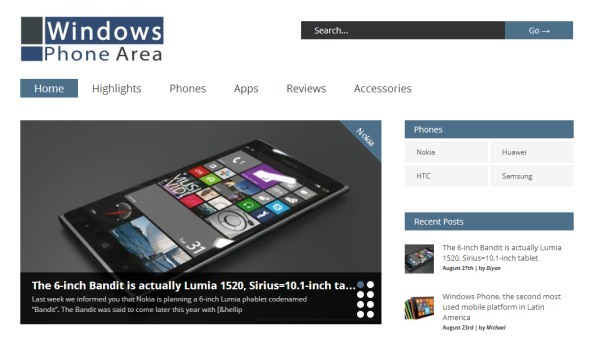 Windows Phone Area, an independent online magazine is now live. Windows Phone Area is a reliable source of fresh information about Microsoft’s latest mobile platform, apps, mobile devices and all about Windows Phone. It carries up-to-date news, publications and selected quality articles around popular topics. The Windows Phone Area team consists of technology and phone enthusiasts who came together to create this website. ‘Our mobile experts provide unbiased reviews of selected models. We will publish them in the “Reviews” category. We don’t forget that there are many cool phone accessories on the market. That’s why we have a separate “Accessories” section where you can read about some new and attractive gadgets and accessories. We also know that there are tons of new apps in the Store. The mobile platform in growing rapidly so Windows Phone Area will try to inform you of any significant changes, updates or brand new apps for your smartphone’. We hope you will enjoy browsing www.windowsphonearea.com. This online magazine is for you. This website is an independent source of information. It has no connection with Microsoft Corporation. Windows® is a registered trademark of Microsoft Corporation.